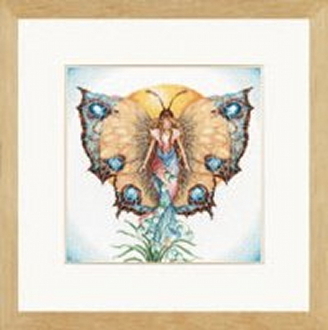 Our Products >> Maria Van Scharrenburg Fairy Cross Stitch Kit - Day - 16" x 16"
Maria Van Scharrenburg Cross Stitch Kit produced by Lanarte - "Day"
A beautiful Fairy with Butterfly wings, an exquisite kit with stunning details. Make sure to get the companion kit "Night" item 50-100. Made in Holland. Design size: 16"w x 16"h (40cm x 40cm). 100% Cotton 27 count Ivory Evenweave fabric, 100% pre-sorted cotton threads, needle and instructions. Maria Van Scharrenburg Fairy Cross Stitch Kit - Day - 16" x 16"